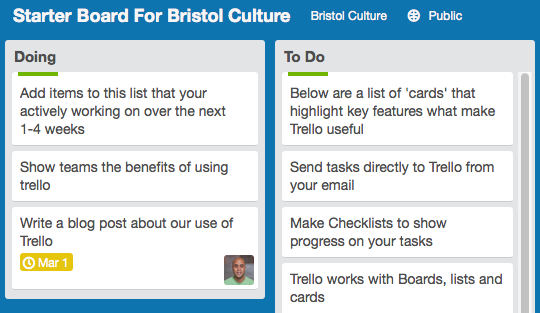 At the museum (Bristol Culture) we use Trello, a free online task management tool to help us work together. Trello allows you to assign tasks for projects to individuals and groups of collaborators and track delivery of said tasks in a simple visual way. For example you can see our 2014-2020 Digital roadmap which is a series of ‘To-Do’ lists of projects and tasks ranging from small to multi-year, each with an assigned member of staff responsible. This particular programme of work is publicly viewable to show transparency and let potential partners see our areas of focus. Trello calls each ‘chunk’ a board. A board has one or more ‘To-Do’ lists, a status of private, shared to a group or public and members who can change the board items which are called ‘cards’. Clarity of communication and speed. With over 200 staff and countless partners and collaborators keeping track of what we’re all up to is impossible through email or staff meetings. Trello is specifically made to help show ‘one to many’ what is happening, who is responsible, what an items status is and what has recently been completed . For example when the core management team (Laura, Ray, Phil and myself) make a decision that affects others we note the date, subject and decision outcome for all to see. Trello has a search facility making it quick to find outcomes. We’re starting to find that trello makes lots of meetings more focused and you don’t lose track of where you are. I use it for all my team 1:1s (nothing confidential of course), key programmes and projects. I love that it works on any device making me flexible about when and where I work and it’s simple to use for all. Management team review trello on a weekly basis together using a large TV, saving paper in the process. Check out the starter board which introduces our staff to Trello and let me know what you think of Trello. Trello’s simple enough that anyone can use it, but it’s also incredibly powerful—especially when you pair it with Zapier integrations. In this article, you’ll find some of the best ways people are using Trello to get things done and have fun, along with some of Trello’s best hidden features and ways to make it more powerful.